Plymouth Gin was one of The Gin is In’s earliest 5 Star Gin Reviews. As part of the 50 States of Gin tasting, we had a Navy Strength Gin tasting where we compared some of the big names in the industry to some of the new offerings from U.S. microdistilleries. Plymouth Navy Strength is the five hundred pound gorilla. One of the best gins out there with one of the most storied pasts, and this gin whose Navy Strength gin is perhaps most synonymous with the term Navy Strength Gin. At 57%, its heated and intense. But this shouldn’t come as a surprise. How does Plymouth’s Navy Strength Gin stand up to the lofty standards set by its forebearers? 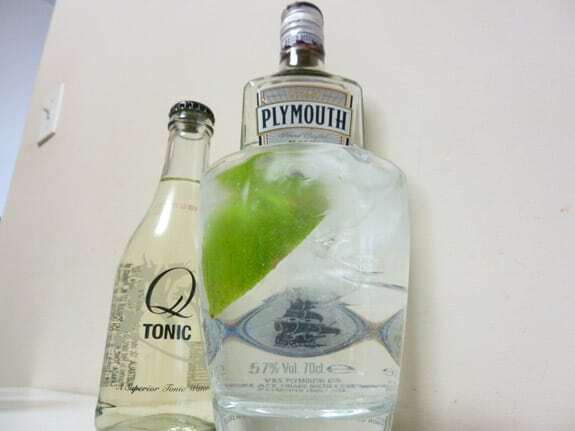 Q. Aaron, does it taste significantly different than the regular Plymouth Gin? A. The strength. No, rather, the lack of dilution. It emphasizes different notes. (drinks gin) Really, while the mainline gin you kind of feel this balance. (drinks gin) Here the citrus seems rather dominating. The juniper comes in on the finish. Q. Does the 57% affects its drinkability? A. As I’m drinking it right now. Neat. A little bit, honestly, I’d be hesitant to recommend it to someone neat. But you’re not going to be drinking it neat, right? Q. Probably not, so back to the taste, what can you tell me about the nose? Q. And what if you dilute the gin with a bit of water? A. It does begin to take on a bit of that classic Plymouth flavor. I don’t have the regular Plymouth to taste this side by side, but I will say that off the top of my head. And the [unintelligible] times I’ve had Plymouth I’d say they’re pretty similar. Q. Can you tell me a little bit about Mixing with Plymouth Navy Strength Gin? A. Sure, what would you like to know? Q. Tell me what you’d say in a normal review. A. Okay, what would you like to start with? Q. How about your favorite. The Negroni? A. Top notch. Navy Strength is Uniquely suited for this cocktail. Lots of powerful lower proof elements. Some gins can get lost. Not Navy Strength, and especially not Plymouth. You get the orange in here. (pauses) even without the sort of non canon addition of the orange rind or orange zest that I’ve seen in some cocktail bars. Q. What about in a gin and tonic? A. Let me first start by saying that a picture is worth a thousand words. A. (continuing) It works really well with Q Tonic, a lot of lime to add some balance to the citrus. It cuts back on the orange and lemon. I really think lime works well here [unintelligible] (sipping noises) But although I love the way that Q Tonic and Plymouth work together. This isn’t my favorite cocktail with Plymouth Navy Strength Gin. A. Yes, normally I think that the best cocktails with Navy Strength are the ones where you sometimes crave a little bit more. Kick. So say an Aviation, Moonlight, any of those in kind of that Creme De Violette family…. Q. (interrupting) Is there any cocktail in particular where it doesn’t work? A. Martinis, its a little too much. I’d cut it with 1/3 water, or make it a two to one part gin to vermouth. Which although technically closer to the official ratio. Most people just don’t drink their martinis that way. The way most people do martinis I’d be hesitant to endorse it. Its just too much, and its going to get you really drunk really fast. We are talking a full 30% more proof than usual. But to each their own. It still tastes good. Just might be a bit too intense. A. Pretty much everything in that family. Alaska Cocktail, that sort of thing. (sips drink) But oddly enough, a lot of people recommend it in a Pink Gin. So there’s a lot of people reliving a supposedly authentic Navy experience. Adding bitters to their gin and nursing it. A. the Price is about 45 dollars when translating the price in British pounds to U.S. Dollars. That will get you 700 milliliters. Q. Where is it from? 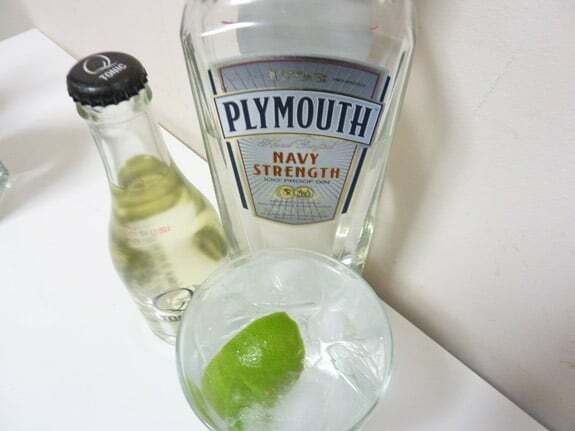 A. Plymouth Navy Strength Gin is from the United Kingdom. Plymouth to be exact, as Plymouth Gin is a protected term that can only be applied to gin made in Plymouth. Q. Where can you get it? A. It will soon be available in the States, but generally very readily available overseas in the UK. Q. How is it Best Consumed? A. It amps up all of your classic cocktails a couple of notches. Seriously, use it to add a kick to a cocktail that needs a little bit more potency. Although I’m hesitant to endorse it outright, if you’re looking to make 1 part gin, 2 parts orange juice, this is the kind of gin you want to use. It will take a lot of Orange Juice to be drowned out. Stars in a Bloody Mary too. With all of that tomato and otherwise powerful flavors, it keeps the gin in a starring role. Q. Do they have a Website? Q. And if I you don’t mind, could I hold you to give Plymouth Navy Strength Gin a rating? Just something off the cuff, your gut feeling. A. If pressed to give a rating, I’d have to give it four drinks out of five. [Rating:4/5] Its a good gin still, and one that does a lot of things well. But it really doesn’t add anything other than extra alcohol percentage to the original formula. Like I said, it works well, and has its place. I love making cocktails with a Navy Strength Gin, but unless you’re really in a position where you need your drinks to maintain a certain strength, if you only have the regular mainline Plymouth Gin available (sips drink) it will be more than acceptable. Q. Thank you for your time Aaron. A. Thank you for having me. But first, one more photo. This gin makes the best dry martini i have had. You dont just drink you truly enjoy the moment.